The Brahui of Afghanistan live in an area known as Registan, or "land of sands." 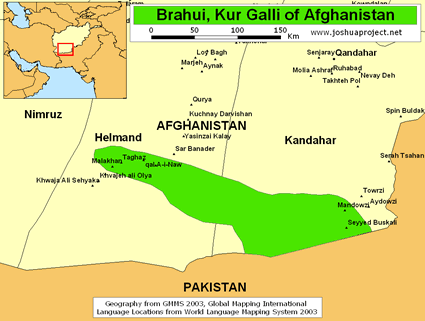 This region lies in southern Afghanistan near the border of Pakistan, where the main group of Brahui lives. The Brahui are made up of a confederation of 29 tribes. They are distinguished from their Pushtun and Baluchi neighbors by language. 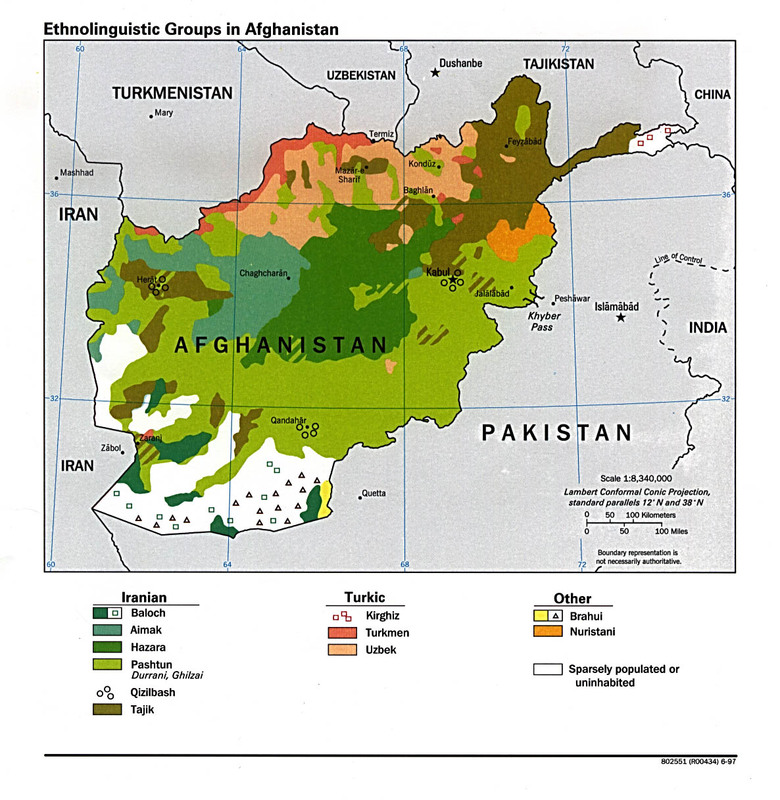 The Pushtun and Baluchi speak Indo-Iranian languages, while the Brahui speak a Dravidian language. This is somewhat of a mystery to linguists because most Dravidian-speaking tribes live in southern India, more than 1000 miles away. The Brahui first rose to power during the 1600s when they overthrew a dynasty of Hindu kings. Under Nasir Khan, the confederacy attained its peak in the 1700s. The 29 tribes owe a loose allegiance to the Brahui of Kalat, who have long been associated with the confederacy's destiny. A group of eight tribes is believed to be the original Brahui nucleus. They constitute a little over one-tenth of the Brahui population. The Brahui have a reputation of being a fierce tribe of strong desert men who submit to no law except the law of retaliation. Their resistance grows with the hardships of the environment in which they live. The Brahui are primarily nomadic shepherds, traveling from place to place in search of water and pastures for their flocks. In Afghanistan, their lives revolve around the movement between wells that are as far as 45 miles apart. Many also migrate to Iran in search of grazing land. Winters in the highlands are cold and icy. During those months, the Brahui live in the plains. They return to the hills only after the lambs are born in February or March. The Brahui have voluntarily organized themselves into groups of cooperating households called khalks. Each khalk has combined their herds into one flock under the care of a professional resident shepherd. The khalks are very beneficial to the economy of the Brahui. By utilizing a resident shepherd who can control up to 500 sheep, the men and their adult sons are able to work on local village farms in return for wheat, and to take their stock to market for sale. They are also free to exchange information with other Brahui about the locations of other camps and flocks. 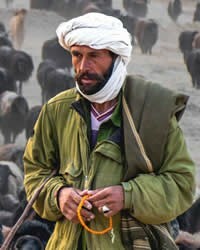 The Brahui have become expert shepherds through the use of the khalks. They have learned the maximum number of sheep that can be grazed together. They have also discovered that sheep are not happy in very small groups and that they spread and wander under these conditions. When the herds increase to more than 500 animals, the khalk will multiply, and a shift of tents will form a new khalk. Brahui marriages are arranged within the families. Cross-cousin marriages are preferred, especially between a man and a cousin on his father's side. The wishes of the couple are also considered. Although it is permissible for a man to have several wives, the expenses incurred tend to limit this practice. Divorce is rare among the Brahui. The ideal family consists of married sons who live with their parents. After the father's death, the brothers continue living together with a united family estate, following the leadership of the eldest son. The tribe is the basic political unit of the Brahui. Members of a tribe are related through patrilineal descent (common male ancestors) and political allegiance. Virtually all of the Brahui are Sunni Muslim. Like other peoples in Afghanistan, they are deeply rooted in their Islamic beliefs. They adhere to the five essential duties of Islam: praying, fasting, giving to the poor, affirming that "Allah is the only god and that Mohammed is his prophet", and making a pilgrimage to Mecca. There is a need for laborers who are willing to adapt to the harsh nomadic lifestyle of the Brahui in order to reach them with the Gospel. * Ask the Lord of the harvest to send forth willing laborers into Afghanistan. * Ask God to strengthen the Brahui believers and to give them boldness to share the Gospel with their own people. * Pray for the effectiveness of the "Jesus" film among the Brahui. * Ask the Lord to bring forth a triumphant Brahui church for the glory of His name!View Brahui in all countries. Location in Country: Helmand and Kandahar provinces: Chakhansoor to Shorawak among the Balochi [bgn].